Trust me we know how frustrating it can be to try to get the right size bridle. That is why we offer all sorts of pieces in different sizes. We also offer a ever expanding line of Larger Browbands. If you need a bridle part let us know. we will often take the needed piece off of our imported bridles. Black leather 1 5/8" at center. The ends will allow up to 1 inch wide bridle, 1 1/2 inches if you clip a few stitches. Available in sizes 17", 19", 20" and 21"
This black leather browband has rows of Black and White Crystals. All Black leather Available in sizes: 17", 20"
Size: 16 1/2", , 16 3/4", 17 1/2"
Basic McBrideTM padded Browband is made of the finest English and European leather, a full grain cowhide for durability. The epidermis (top grain of leather) is the strongest, most abrasion resistant part of leather. McBride leather is aniline finished – never pigment (painted) finished because paint can cover flaws in leather and seals the surface, stopping proper penetration when you oil your tack. Smith-Worthington uses only first quality hides, tanned and curried to look good, accept oil and darken and mellow as you use your tack. The McBride bridle parts are beautifully finished - carefully hand stitched, creased, edged and hand rubbed as English bridlemakers have done for centuries. G. McBride & Son offers this exceptional quality at a very frugal price. Imported. Black Leather Browband with Gold Chain, Padded 18"
Leather is 1", with padding 1 1/2"
These leather english reins are 5/8 inches wide. Where the lace part is the width with the extra leather is 3/4 inches wide so it will feel slightly thicker. They have stainless steel buckles in the center and at the bit ends. Leather with 27" long solid rubber in grip area. Black has been ordered. Check back to see when it is available again. Black Leather Reins 3/4", 66"
Black has been ordered and will be added as soon as we receive the order. Second set of reins for double bridle. Whether you need a replacement noseband or one in a different size, we offer a flat Noseband. 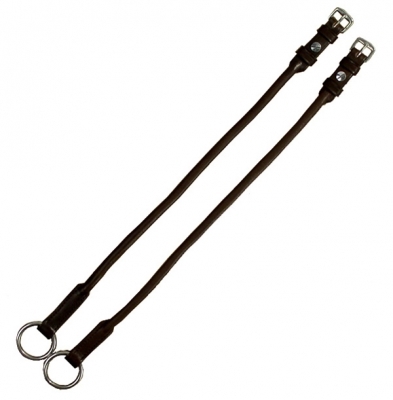 Dark Oil Plain Reins 56"
Plus+TM bridle parts are made of the finest continental leathers and stainless steel hardware: * Full grain cowhide for durability. The epidermis (top grain of leather) is the strongest, most abrasion resistant part of leather. * Plus+ leather is aniline finished - never pigment (painted) finished. (Paint can cover problems in leather and seals the surface, stopping proper penetration when you oil your tack.) We use only first quality hides, tanned and curried to look good, accept oil and darken and mellow as you use it. * Stainless steel buckles strong and rustproof. Plus+ reins are beautifully finished - carefully hand stitched, creased, edged and hand rubbed as English bridlemakers have done for centuries. Exceptional quality at a frugal price. Add this Bradoon Strap to your Draft size black English Bridle and add a second set of reins and you have a Double Bridle. This allows you to try riding with a "double bridle" without a large investment. You can convert your existing bridle into a double double. It can also be used for a replacement for a broken bradoon strap.